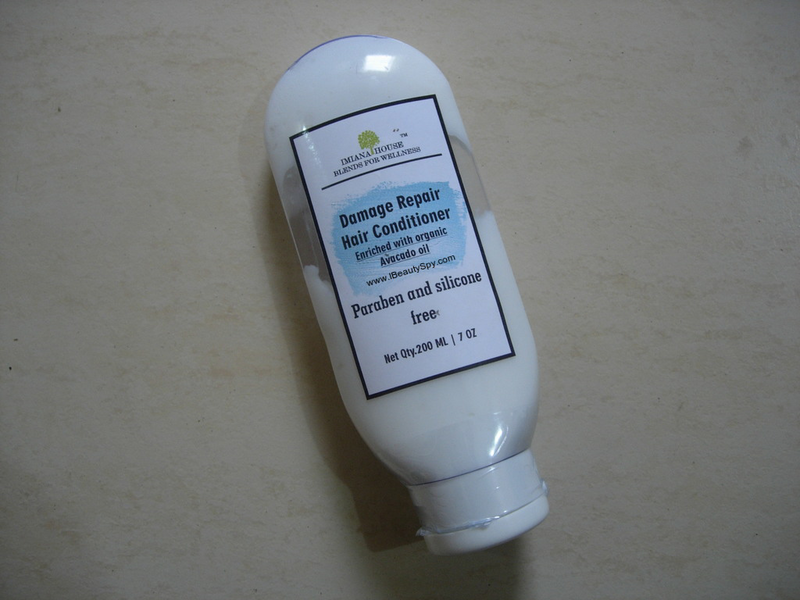 Damage Repair hair conditioner is specially formulated to reverse the damage caused to hair due to pollution and heat. This conditioner is regenerating hair re-builder for dry, damaged hair. Helps revitalize & reconstruct hair. Gives persistent conditioning benefit and give you bouncier, intensely hydrated & more lustrous hair. Organic Avocado oil, Vegetable glycerine, Myrhh, Sweet Orange and Calendula essential oil, Vitamin E and Ecocert Lecithin(green). Imiana House Damage Repair Avocado Hair Conditioner comes in an inverted squeezable tube packaging which is convenient and travel-friendly. But I still wish the brand makes the packaging more luxurious as when we pay more price for a brand we expect a more lavish packaging. The brand has 3 variants of conditioner – Nourishing and Balancing Conditioner with Jojoba oil, Argan Oil Conditioner with argan oil and organic matcha green tea. And the third one is this. Imiana House Damage Repair Avocado Hair Conditioner looks milky white in color and has a smooth creamy consistency. The texture is medium, not very runny or thick, just perfect. Like all other products from the brand, this conditioner doesn’t have any fragrance. I recommend Imiana House products to sensitive-nose people especially for this reason. Some people are sensitive to fragrances, whether artificial or those from essential oils. This absolutely doesn’t have any smell at all as hard as I tried to sniff it 😀 . I just squeeze out two dollops of Imiana House Damage Repair Avocado Hair Conditioner and spread them on my hair lengths. I have long hair so I require more quantity. I apply more on the ends which get dry soon and prone to split-ends. I leave it on for 3-5 minutes and then wash off. It is easy to rinse and washes off quickly. 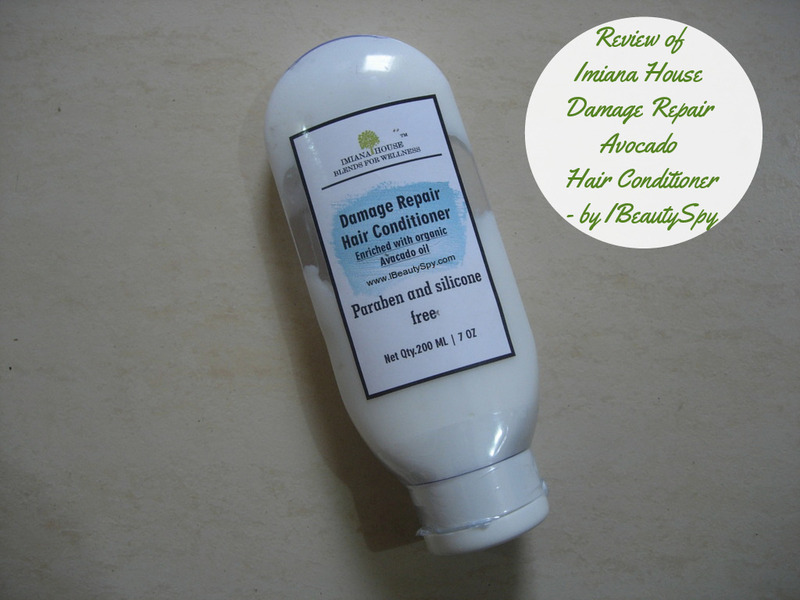 Imiana House Damage Repair Avocado Hair Conditioner detangled my hair so easily. I usually have to spend a long time after shower to detangle my knotty(naughty! 😠) knots. But this conditioner smoothened my hair so much and saved me tons of time in detangling. It both hydrated as well as nourished my hair (water content as well as oil content). It also helped to straighten hair. It didn’t weigh down my hair and also added bounce and shine. The avocado oil does help in strengthening hair and controlling hair loss. 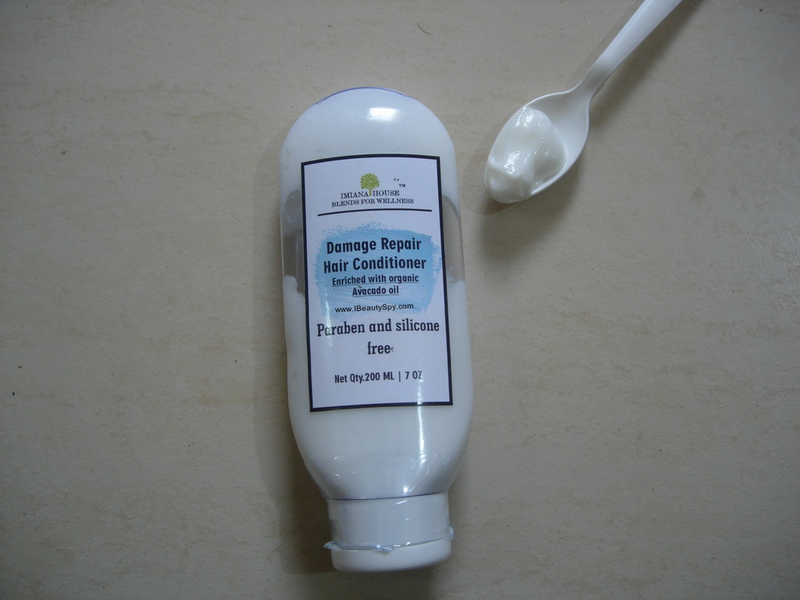 The name of the product is ‘Damage Repair Conditioner’. So you might be asking whether it helps to repair damage? From my experience, I didn’t have much damaged hair. Just very dry, frizzy hair and the ends were super dry. Damage due to excess dryness. It did help a lot in fighting dryness and frizziness and the ends were more hydrated and tamed. As a result of which hairfall was reduced and split-ends were prevented. But can’t comment on whether it will work on very damaged and heat-treated/colored hair. Imiana House Damage Repair Avocado Hair Conditioner is free from parabens and silicones. If you don’t know, most conditioners in the market are loaded with silicones. Even the ones from some brands claiming natural. Using silicone-based conditioners can lead to hairfall in long term. If you are facing hair loss, my first advice would be to shift to sls-free shampoos and silicone-free conditioners. I have detailed a natural hair care routine for healthy hair in this post here (which also happens to be the first post in my blog 😀 ). The preservative used in this conditioner is Ecocert Geogard Ultra as disclosed by the brand. Also the glycerine used is USP grade 100% vegetable glycerine. The emulsifier is also ecocert certified olive based one. You can be sure that Imiana House never compromises on the quality of the product. The only con I found with this product was its too pricey. And since I have long hair I use up conditioners fast. So this is not an economical option for me. * Helps to detangle hair very easily. * Provides both hydration and nourishment to hair. * Smoothens hair and reduces frizz. * Avocado oil strengthens hair and controls hair loss. * Doesn’t weigh down hair. * Makes hair bouncy and adds shine. * Repairs dry, damaged and dehydrated hair to an extent. * Convenient inverted tube packaging. * Free from parabens, silicones, mineral oil, artficial fragrance and color. Yes. You can also try their other variants jojoba or argan matcha green tea depending upon your hair concern. No. Its expensive for me since I have long hair. But if I find it on a good discount, I will buy. 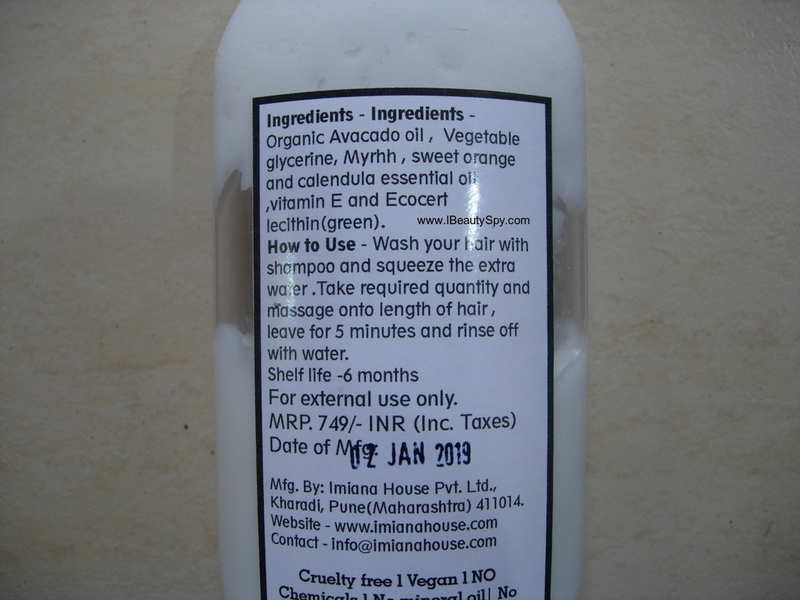 Overall, Imiana House Damage Repair Avocado Hair Conditioner is a nice cruelty-free, vegan conditioner with a clean and organic certified ingredients list. The brand is transparent about the full ingredients list in mentioning the preservatives and emulsifiers used. All the ingredients used are high quality and you can feel it in the product. 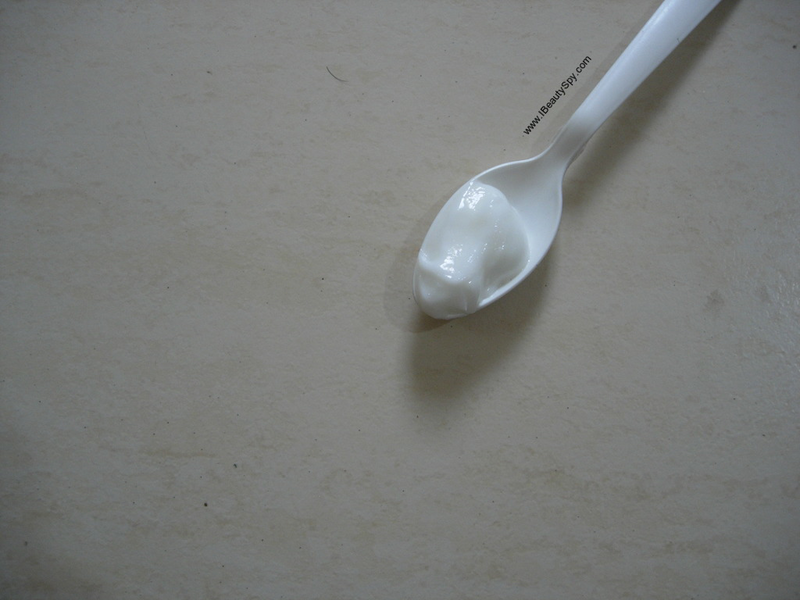 If you are looking for a trustworthy hair conditioner which contains minimal, quality and safe ingredients and also shows good results, then I would recommend this. And if you are okay with the price. If you do see it on a good discount, then grab it for sure. I does seem pricey but must be due to organic avocado oil as the base. But a good review anyway. Good to see more silicone free options in the natural beauty market.